Sunlight. The reason why life exists on this planet. And one of the main mechanisms whereby life is recycled by the planet, in a continuous process of deterioration and rebirth of all organic matter. We are all perishable, as are the goods we most treasure. That includes our art collections. The best we can do is to protect, monitor and care for them so future generations can learn from them. So, what causes deterioration in wine? How does wine interact with light? What can be done to arrest it? This article will take a partly-scientific, partly collector-centric viewpoint to understanding these issues. It is the careful preservation of all of these components that enhances the investment value of a wine collection, by ensuring that the aroma, body and taste are not degraded by excessive light exposure. How Does Light Affect Wine? 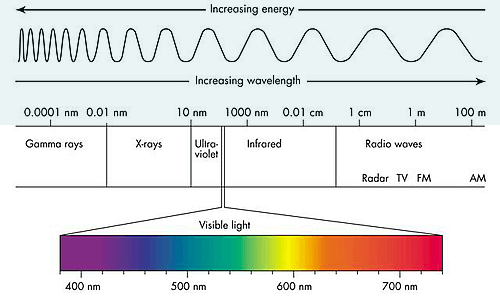 Sunlight is comprised of various bands, shown above, from short wavelength, highly-destructive gamma rays on the left to longer-wavelength, benign radio waves on the right. In the middle, we see a narrow band corresponding to visible light. Sunlight is clearly the main source of damaging radiation but in retail and domestic environments artificial light sources, such as fluorescent tubes, also contribute to the damage by emitting UV radiation as well as visible light. The following graph, with kind permission from WRAP.org.uk, shows how much radiation by wavelength is absorbed by white, rosé and red wines. Wherever radiation is not transmitted, it is either reflected or absorbed. White wines absorb radiation up to 380 nm (in the UV-A range). 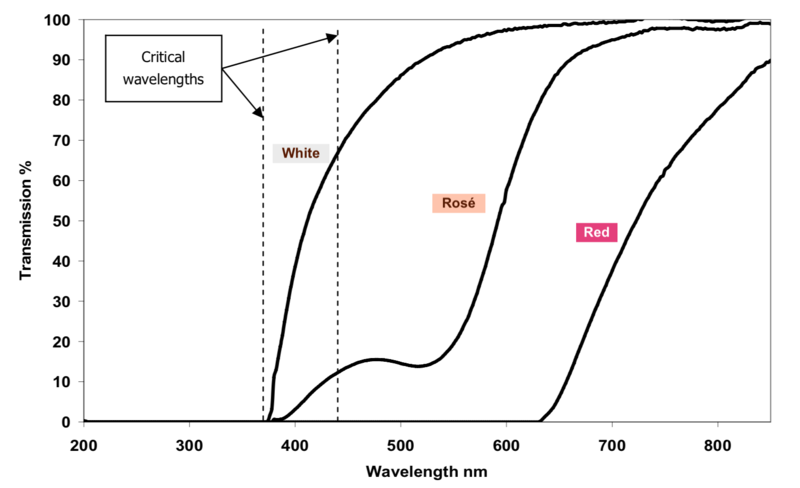 Rosé wines likewise absorb UV up to 390 nm. This absorption causes damage to the wine by triggering internal chemical reactions at specific critical wavelengths. More on that below. Red wines absorb radiation well into the 650 nm wavelength range (in the visible range), although this is moderated somewhat by tannins found in the skins of grapes. The absorbed radiation causes a phenomenon called light strike. Light strike refers to the unpleasant odour and taste resulting from light exposure suffered by wine. This is caused by Riboflavin (vitamin B2) being photoactivated at the critical wavelengths of 375 nm (UV-C) and 440 nm (visible), transferring energy to amino acids such as methionine and cysteine which generate volatile compounds such as hydrogen sulphide and Mercaptans. One example of the latter is 3-methyl-2-butene-1-thiol, or MBT, which imparts a smell of ‘leek, onion, cooked cabbage, wet wool or soy’, [Ref.1]. Luckily, nature is wise and has blessed wine with phenols which give natural protection against light, but not all wines are created equal and phenol content is higher in red wine due to the tannins present in grape skins. As a result, red wines suffer less from light strike than white wines. 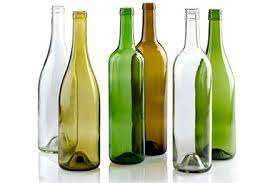 The most common solution to filtering out harmful UV and visible radiation involves packaging wine in coloured glass bottles. The colouration results from mixing metal oxides based on cerium, vanadium, manganese, titanium and iron into the glass mix to alter the glass chemistry. Clear glass blocks radiation up to only 300 nm and green glass blocks wavelengths up to 320 nm [Ref.1]. It is amber glass which gives the best protection, blocking radiation up to 500 nm (including 99% of all UV) but is not popular due to the poor aesthetics of the dark coloured glass which impedes the marketability of the product. A ‘light balance’ is therefore necessary to not only protect the wine but also to improve the aesthetics which makes the product visually appealing. The cork is harvested from the cork oak tree (‘Quercus suber’) and serves to control the oxidation of wine, allowing it to age directly in the bottle. Cork is impermeable, elastic, fire-retardant and hydrophobic. If a cork stopper allows 1 mg of oxygen into the bottle per year, this oxygen will break down 4 mg of sulfites [Ref.3]. About 20 mg/litre of sulphites are added during wine bottling (on top of the sulphites produced naturally during fermentation). According to these numbers, the wine should no longer have any protection against oxidation after about 5 years. However, since the porous cork passes oxygen best when the cork cells are full of air, this flow of inbound oxygen can be stemmed over time if the cork is kept wet, normally by laying the bottle on its side, and this stops total oxidation of the wine. Also, cork is sensitive to fluctuations in temperature and humidity, which are driven by infrared radiation. This leads to cork desiccation and even shrinkage, which either allows wine to seep out or air to seep into the bottle (oxidising the wine and turning it into vinegar). Once a cork dries out, it doesn’t rehydrate. Used for wine bottles but also historically for sauces and perfumes, labels have been made since the 1700s from silver, enamel, pottery, porcelain, ivory, bone and mother-of pearl. More recently, they have been made from paper. These materials are liable to suffer not only colour fading but also a reduction in mechanical strength, leading to embrittlement, a loss of flexibility and darkening. Reference 2 also summarises the effects of placing highly sensitive materials at different light levels, showing how long it takes on average for ‘noticeable’ or ‘almost total fading’ due to light exposure. 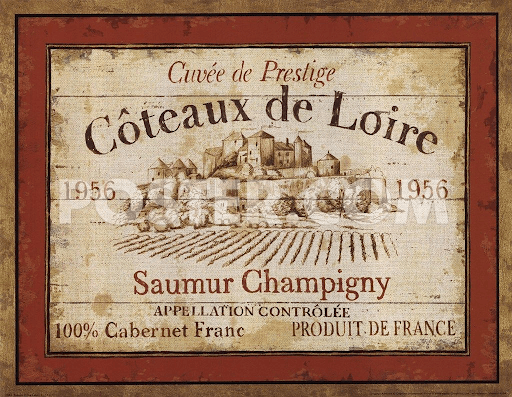 Since we do not typically find wine collections exhibited in museum-grade lighting environments of 50-150 Lux, but rather retail and domestic environments from 500 to 5000 Lux, we can expect paper labels to suffer noticeable damage in a matter of months to years. Since about 50% of sunlight is infrared (ie. heat), any incident daylight can lead to temperature and humidity fluctuations, damaging paper labels by hydrolysis and biodeterioration, and resulting in brittleness, discolouration and loss of the information printed on the paper. Sustained vibrations agitate the contents of a wine bottle and may originate from machinery, noise, nearby railway lines, roads etc. The net effect is to disturb the sediment and is akin to shaking the wine repeatedly. This speeds up chemical reactions inside the bottle and can lead to a rapid demise in the value of the collection. Since cork is porous, any external odours can impregnate it and enter the wine. Fluctuations in temperature and humidity which affect the integrity of the cork will amplify this risk. The worst culprits are bleach and petrol which should be kept far from a fine wine collection at all costs. Refrigeration and ventilation are important factors to avoid the formation of musty mouldy smells, which can propagate through the cork and into the wine. It is also advisable to avoid storing fruit, vegetables or cheese near a fine wine collection since they ferment, adding yeasts to the poor quality of air. A wine collection will fetch much higher prices at auction or market if they are in pristine condition, in their original packaging and with no signs of damage or stress. Light exposure damages wine through a process called light strike by photo-activating riboflavin at 375 nm (UV-C) and 440 nm (visible) wavelengths, resulting in unpleasant odours and tastes. The best solution involves limiting these wavelengths specifically, but also limiting all UV, visible and infrared in order to reduce fluctuations in temperature and humidity, which damages not only the wine but also the cork and the label. Read about how light affects organic materials such as paper, parchment and vellum in our Blog article on Incunabula.